Word is, it's a drop to Aqaba, so I'm going for it. The alarm goes at 5:00 am and in spite of my nervous energy I still can't get myself packed, lotioned-up and on the bike before 6:12 am. At the police circle I stay parallel to the slope, following the signage to Tayyibeh. It's a slow steady climb across face of the hills, but the view is perfect. Still in suburbia I buy a Fanta and try with limited success to get a Jordanian boy to take a scenic shot with me in the picture. A minute or two later two guys in a balcony next to the road wave me over for tea. A third cup is sitting there, already poured. Perfect! At 8:30 am signage reads "Aqaba 100 km". Somewhere before 9:00 am I stop at a view point and spot a vendor setting up an outdoor table. He agrees to take a photo of me. This has the potential to be my "official shot" -the one photo that captures the trip-and I gesture with my toe, pointing at the front of my bike tire, and trying to make sure that all of me is in the picture. He takes two shots, with and without my helmet on. I look at the shots and am very pleased. I ride on. I take a right, continue through some rolling hills, then drop gently to a T-intersection, which puts me on the main road south. 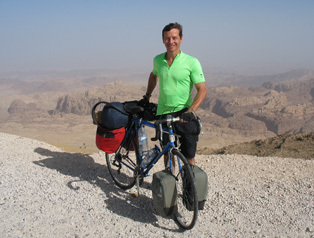 The Desert Highway is a bicyclist's dream, at least if they are heading south, as I am. It's a separated highway, two lanes plus a shoulder, all of the road in perfect condition, light traffic and big downhill curves. 11:55 am - "Aqaba 46 km". I started with only one full 1.5 liter bottle, and I've been keeping an eye on water availability. At what I think is my second water stop two young boys (one with a bike, one jogging beside him) guide me across the highway to the mini-market. The counter person charges me 1.5JD for a water plus 500 ml soda, and I'm annoyed. "Tourist price?" I ask. Moments later there a couple of customers are at the counter and a Jordanian gets a big coin back after his water purchase. I make a bit of a fuss and the clerk gives me an additional half-JD back. On the front stoop of the market, the two kids poke around my bike. I had already given them hard candy when we first met, but I'm very touched when they go inside, buy a juice box and offer it to me out there on the stoop. Wow. This is about as far as can be from the rock-throwing I had prepared for. At 12:15 pm a sign "Aqaba 38 km". This is the Rum turnoff. 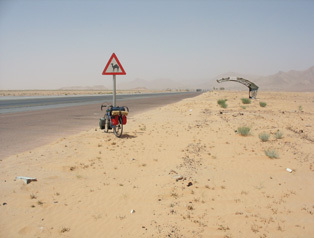 Now I'm alone - pushing through the Arabian desert, midday, mid-June. Almost every truck coming the other way sounds its horn, the driver waving encouragement. 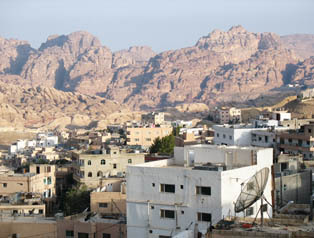 Aqaba. There it is in my memory: Peter O'Toole calling out the name as he gallops across the desert. 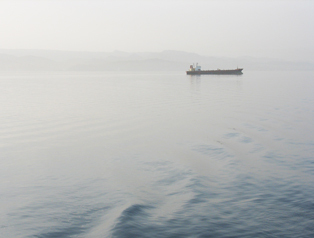 Aqaba. I've made it (almost) to my final border! At 1:06 pm - "Aqaba 15 km". Back in Petra I've been told by someone (Ali?) 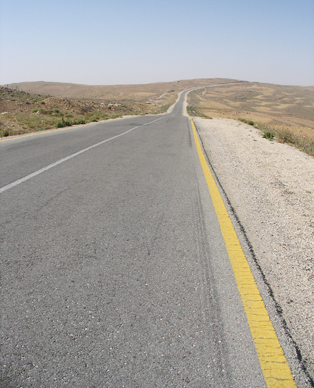 that 3 k after the customs inspections buildings and 15 k before Aqaba I should take the right road to avoid some climbing. He then said take the auto road, which made less sense since I would expect any truck route to be more slope friendly. Well, I pass the customs buildings and sure enough, 3 kilometers later, come to a decision; the left road labeled Aqaba downtown and the right path labeled Container port, trucks compulsory. Since Ali had nailed the distances, I had to trust him here so I take the right road, the one headed for the container port. Within moments I'm on a gentle long climb. Trucks are scattered in front of me, some are going slow enough, that I could grab on if I wanted. But remembering how hot it is, I dare not touch the bare metal surfaces of the trucks, never mind cling to them. Signage appears: "Saudi Arabia - left," "Container port - right," and I go right. I'm now at a big traffic circle and signage reading "Container port - straight; Industrial area, Saudi Arabia - left". 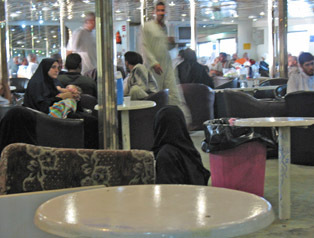 But there is a separate small sign that reads "Ferry Terminal" and points to… Saudi Arabia. I stop my bike and assume my "I'm lost" posture. Within a minute or two a taxi pulls over and confirms that I go towards Saudi Arabia one or two kilometers. Then I'll see a turnoff for the ferry. I'm so grateful to this taxi driver. It's been a long remarkable day, and I almost got killed. It's pretty evident that I wasn't a potential fare, yet he pulled over to help me. Thank you! Sure, there's some "tourist-price" crap going on, but there are lots of really great people here. I hope America treats its guests half as well. It's 2:40 pm and I'm at the ferry terminal. 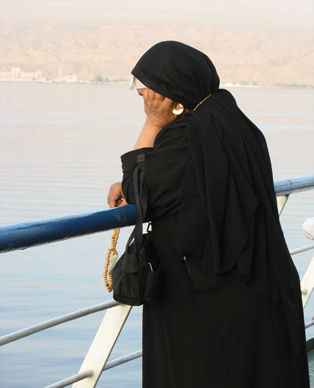 The guidebook said that there was one fast ferry per day and one slow ferry, but I wasn't really planning to catch any ferry today; I just wanted to avoid the climb into Aqaba. But here I am. At the entrance to the ferry area I ask if there ferry today. "Yes, 3 pm." Wow! I bicycle in, visit the information booth, and then learn the multiple steps to take. The fast ferry is gone, but the slow ferry leaves in about an hour, it costs US$40, or 29JD, requires a 5JD departure tax, plus an immigration passport check. Pointing into the parking lot, a friendly employee explains that I put my bicycle in that baggage cart and board the bus that will be right there. I get my passport stamped, then go down to the staging area where I do re-pack, putting my sneakers on and making one pannier into a day pack, complete with change of clothes, reading materials, and valuables. The prices at a little mini-store in the parking lot seem very fair, so I buy and chug four 200 ml Fantas, then buy a 1.5 liter water bottle, then turn over my last JD coin and ask for four breads. "Five piastres each," I'm told, then he asks if I want cheese and holds up a cardboard wheel containing eight of those little individually wrapped breakfast wedges. "Forty piastres", he says, and I end up with the complete box of eight cheeses and four breads for half a JD. Another of the great bargains in this otherwise expensive country. The bus takes us the short distance to the ferry and I hope that my bicycle is also catching the same boat. On the boat I'm asked to turn over my passport and I told that I will be given it later. I see cabins. I try to see if I can buy a shower, but that apparently is not an option. I'm shown a bathroom, where I change tops and throw water on my face. 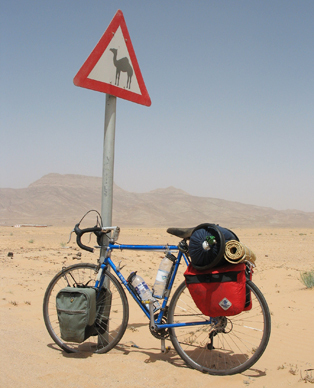 I've been bicycling in the desert for over a hundred and some odd kilometers, and I'm feeling pretty sticky. I'm also too hot to switch from my shorts to the Batman pajama bottoms I put in the daypack. Folks are racing to spread themselves across every possible seating area. I head up a deck and find myself in a crowded noisy lounge that's seen better days. Kids are racing around, babies are screaming, I'm hot and sticky, loud announcements are being broadcast with no English translation and we are not moving. Hours later, perhaps after 6pm, this miserable boat starts moving. I get my passport back and change my last 24JD to 125 Egyptian Pounds, which feels real nice. I finish the bread and cheese, then step outside onto the deck as the sun gets lower. It's definitely nicer outside and I should have moved out here earlier. I'm reading Saul Bellow's novelette Seize the Day from a college textbook I've been carrying for the last month Classics of Modern Fiction. Sort of a depressing story and the boat atmosphere is depressing. I'm the only tourist on it and it seems that this slow boat does not have those $1beers that have been mentioned in the hotel back in Petra. We finally arrive in Egypt and nothing happens. The doors to go downstairs in the boat seem to be locked. I'm miserable. It's 9:40 or so. One person makes a motion on their watch. I guess that means that we wait. Maybe 40 minutes later we're allowed to get off. At the base of the boat I ask about the bike and after explaining that it was on the luggage cart I'm directed across the yard to what I'm told is customs. The cars driving off the ferry have roof racks crammed with packages. It looks like a scene from Grapes of Wrath. I turn into the customs shed where all the action is at the rear of a large truck, packed to the rafters with baggage. A crowd of a hundred or more is pushing forward to get their stuff. Four or five guys are flinging stuff off the back. Everyone's calling out. Looking at this chaos, I try to decide if my bike is a part of this. Could it have been on that truck? Is it still on that truck? Can a bicycle survive something like that? Where is it if it's already off the truck? I decide to take a photo. It's a wonderful image and this might document the end of my bicycle, and thus the end of the bike ride. The flash is big and bright. People look. OK, that draws attention to me, which may be useful. A minute later two guys come up. "Picture?" they inquire. Hmmm… I've gotten into trouble with my camera before, so the mind's ramping up. The image is quite innocent, though, so I'm feeling OK. I pull the camera back out of the pannier, and hit "preview." I like the picture, but they don't. "Erase!" One guy keeps repeating in a strident tone, "No picture! No picture!" I try to erase the image, but it takes a few minutes. Feels like hours! It's my wife's camera, and although I photocopies a few pages of instructions, I've not bothered to read them since I haven't had any capacity issues. I do manage to get rid of the picture and that eases the tension. I use the opportunity to emphasize that I'm trying to find a bicycle. This extra attention I've earned pays off. A minute or so later, an official leads me out of the crowd, to my bike, which is leaning against a wall, off to the side. As I add my day pannier, a friendly official comes over and guides me across the quad to an X-ray machine, then an inspection booth. I have to take everything off the bicycle, put it through the X-ray machine, and then re-assemble it on the inspection counter. He gives me a sheet of paper and points me toward the exit, telling me something about the sheet of paper. I ask him about the expected fair to Tarabin and am told 15EP. That confirms Lonely Planet's data point, so I'm feeling pretty prepared. Soon enough we are at Soft Beach and the greeting I receive is warm, even though it's midnight. I select the best of these funky bamboo beach-shacks, have a beer, and a shower. Then crash. Looking back at town. The ruins are hidden in the rocks in the distance. I'm happy with the photograph. Nice background, and I've made it to almost to Egypt. The scenery is nice... but this is definately a hostile environment. A nice quiet stretch before I joined the main north-south highway. This is it. Straight, flat, and hot. A closeup of the bike.. 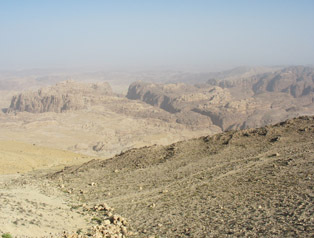 This is the view back down the slow climb just outside of Aqaba. 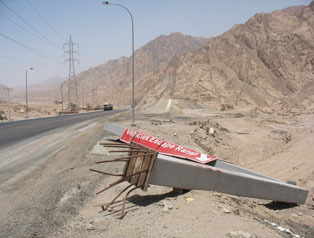 In the foreground is a knocked-over signpost for the runaway truck ramp. Crowded, tired-looking, noisy. The ferry was not a treat. Outside was nicer; many made a point to get out of the lounges. Saudi Arabia on one side; Egypt on the other.